The Borough of Sharpsville was a hotbed of Democrats. Anyone not registered or avowing to the party was looked upon as a misfit in the eyes of believers in the “Great Society.” That included me. The time had come for candidates to enter the political arena. I was approached by a couple of Republican stalwarts to enter the race for borough councilman. Other Republicans who entered previous races had just given up trying to beat the system and the party needed a new face. It was not a big thing for me to take on the task of running. As the owner of a print shop, I could do my own printing, which was always expensive to others – and, to me, a loss wouldn’t be the end of life. My thinking was that I would at least benefit from the name recognition associated with being the only Republican to enter the race for councilman. Flyer advertising August Angel’s run for Sharpsville (PA) councilman, September 1955. I distributed flyers that simply declared my party and offered a synopsis of my schooling, work, and military tour. My son and his friends posted and mailed the flyers and distributed them porch-to-porch. I did not ask for a vote in person from anyone. Therefore, I had not committed myself to any obligation other than “throwing my hat in the ring” as a Republican candidate, a run that no other Republican wished to try for. There was no way I could lose face. On Election Day, the first Tuesday of November , I was busy with printing and helping [my wife] Susie serve meals to a civic club meeting at Angel’s [Casino]. Susie and I cast our own votes, but we mentioned nothing about the election to the kitchen and dining room help that day. Politicians are usually so anxious to keep up with vote tallies as reported by voting precincts that they hang around until every vote is in. They make appearances at voting areas to be seen, suggesting that voters choose them. However, when the civic club had finished their dinner meeting, Susie and I cleaned up Angel’s for the next rental and then retired, with little hope as to the outcome of the voting. The next morning, the Sharon radio news announced an upset in the race for councilman in Sharpsville. August Angel, a newcomer and a Republican, had defeated a Democrat by a sizeable margin and was to be seated with five Democrats and a Democratic burgess in the heretofore liberal stronghold. There really was “no joy in Mudville” for me – the victory was unexpected. I hadn’t worked for the seat, as I was otherwise occupied with my two prospering businesses, my family, and activity in the Masonic Shriners’ fraternity. The seat on Council would mean meetings, assuming an active interest in community affairs, and being confronted with fiscal and physical affairs of a government with which I was not familiar. There would be a lot of quick learning ahead for me. 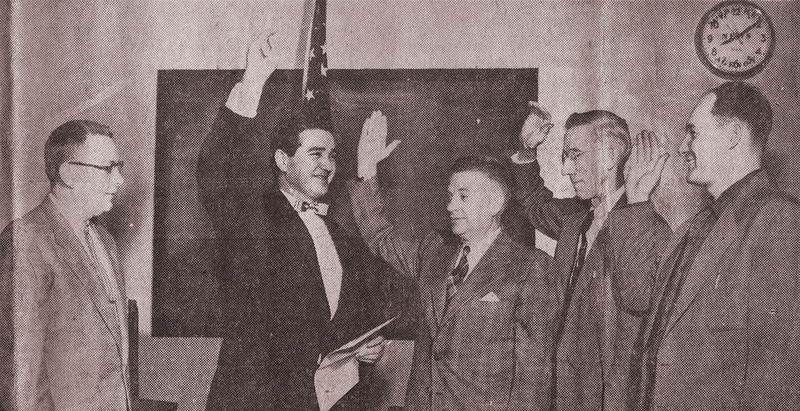 “Three New Councilmen for Sharpsville.” The Sharon (Pa.) Herald, January 4, 1956. Congratulations were copious. One morning, when I opened the front door to descend the stairs to the print shop, I pushed the screen door against an enormous 15-20-pound ham with no tag or identification. I quickly learned it was a gift from the garbage collector who had a bid before council. He used selected borough refuse to feed hundreds of pigs on his farm just beyond the town limits. That ham I kept – but refused any subsequent “pork” or perks in the four years I was a councilman. I had no desire on my watch to gain anything or be in anyone’s debt, even though the job of councilman was an unpaid honor – if you can envision that. For four years, I routinely attended council meetings and offered suggestions or personal opinions. Never was there a confrontation – the members and burgess (George Mahaney) worked amicably. Being the only Republican, I commanded a lot of attention whenever the “chair” recognized me, but I was relieved when my term came to an end. Sharpsville Council Members, c. 1956. August Angel is third from left. Flyer advertising August Angel’s run for the first Mayor of Sharpsville, PA, November 1961. Though lacking the intense ambition of my opponents in the race, I did not fare badly. Again, there was no personal solicitation – only the distribution of handbills. The Democrats had to counter my campaign with printing, meetings, and house-to-house canvassing. When the voting was over and I was defeated, I actually felt thankful. I had enough personal activities — the print shop, Angel’s Casino, and memberships in other service organizations — to attend to. And there would be no long evenings spent in the municipal building! — Excerpted from “Trivia & Me” by August Angel [1908-1996].